Lord Mahavira College is situated on Nalagarh-Swarghat Main Road, about 0.5 KM from Nalagarh at Village Dattowal. Lord Mahavira colllege of Nursing is one of the most modern and well equipped nursing college of Himachal Pradesh. It is widely recognized a centre of excellence in the field of nursing education. This college was started in the year 2004 by a group of dedicated medical professionals who has the vision and determination to provide quality education in the field of nursing. The college being run by Vardhman Educational Society Regd. SRA 1860 which is also running a well equiped hospital by the name of Lord Mahavira Hospital & CT Scan Centre. Lord Mahavira college of Nursing which was started 2004 was premier nursing college in Himachal Pradesh and it never looked back. The college is duely recognised by Indian Nursing Counsil New Delhi by Himachal Pradesh Nurses Registration Counsil Shimla and is affiliated to Himachal Pradesh University Shimla, Summer Hill. The college is in the process of getting attachment with international nursing forums. The college has highly qualified and experience faculty. We have M.Sc Nursing, B.Sc Nursing, teachers. All the teachers are experienced dedicated & devoted to the cause of nursing and work hard to achieve the moto of our society. There are frequent visit of guest lecturers from highly qualified scholars which bring their research to class rooms. The college has three story building. The class rooms are well ventilated with modern facilities like overhead projectors to enhance the presentation of academic exercises. There are Audio Visual aids, T.V, DVD, Slide projectors, sound system, models and charts for the use of students & faculty members. 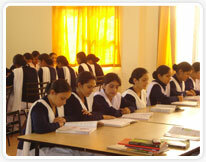 The college has spacious well stocked library with sitting capacity of 120 students. There are about 3000 books on various subjects of nursing. Besides this latest national & international journals on nursing are regularly available in the library. Local news papers & magazines are prescribed for the library for the students. Library is open upto 9:00 AM to 5:00 PM. The college has auditorium where debates and declamation contest are regularly held in the college. We have Photostat facility, telephone & internet facility. Student can use internet to enhance their knowledge and to know latest developments in the field of nursing. College also has open air theatre. There is sick room also in college where medical help is available. College possesses very good and comfortable hostel accommodation. There is 24 hours security electricity supply with generator. The hostel rooms are well ventilated and fitted with tiles. Reading Table, chairs, beds, fans cupboards are provided in the rooms. There is common room with T.V. & Indoor games for recreation of the students. Nutritious hygienic food is served to the students at reasonable cost. Hot & cold water supply is there. There are water coolers fitted with RO which provides safe drinking water. Hostel & bathrooms are kept clean by the sweepers. Keeping pace with the modern development Lord Mahavira college of Nursing has permission from the concerned authorities to have clinical training of its students at one of the oldest well equipped Hospital of Himachal i.e Indira Gandhi Medical College Shimla. This hospital has bed capacity of 650 beds. Students gets training at specialty departments like Neuro Surgery, Neology, Micro Vascular surgery, Pediatric Surgery, Urology, Cardiology, Gastroenterology, Nephrology, Oncology, Endocrinoly, G.E Surgery, and transfusion medicine etc. Our college is also attached with ESI Model Hospital Baddi which having state of art facilities. Other than that our students get training & practical exposure at FRU Govt. Hospital Nalagarh, at our own Lord Mahavira Multispecialty Hospital,Zonal Hospital Solan, Govt. Mental Hospital Amritsar, Parmar Hospital Ropar & other esteemed Hospitals. Our students also visit to various Community Health Centres in our area.